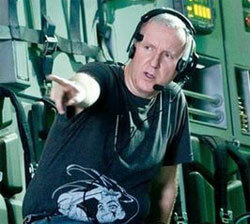 James Cameron is one of the most successful and notorious1 filmmakers in Hollywood’s storied history. His resume boasts2 a number of contemporary3 classics, including 1984’s The Terminator, 1986’s Aliens and 1997’s Titanic. His cutting-edge4 work in the realm5 of special effects has influenced6 countless7 filmmakers and has earned8 him a wealth9 of technical awards, while his movies have launched the careers of such familiar faces as Arnold Schwarzenegger, Bill Paxton and Edward Furlong. James Francis Cameron was born on August 16, 1954, in Kapuskasing, Ontario. Though he spent the first few years of his life residing in Niagara Falls, Cameron’s family eventually10 settled11 in Los Angeles — where he quickly cultivated a ravenous12 interest in all things film. It wasn’t until he saw Stanley Kubrick’s 1968 science-fiction tale 2001: A Space Odyssey that Cameron first considered making his own movies, and he spent the next several years shooting his own short films using his father’s Super-8 camera. After graduating high school, James Cameron’s lifelong13 interest in the sciences led him to study physics at California State University’s Fullerton campus — though he dropped out14 after about a year to pursue15 various employment opportunities and also to spend time with his new wife (a waitress named Sharon Williams). He spent a few years floundering16 before he finally decided to try his hand at filmmaking. To that end, James Cameron collaborated17 with a couple of friends on a 10-minute science-fiction short entitled Xenogenesis, which provided the fledgling18 director with precisely the foot in the door he had been looking for. James Cameron’s first real job within the movie business was as a miniature model maker19 at Roger Corman Studios, where he learned the ins and outs20 of low-budget film-making and eventually worked his way up21 the ranks in Hollywood’s special effects industry. In 1981, James Cameron received his big break22 after he was hired to direct the low-budget horror sequel Piranha II: The Spawning — which, although a critical and financial bomb23, paved the way for his breakthrough24 effort just three years later. The Terminator, released on October 26, 1984, transformed James Cameron into one of Hollywood’s hottest25 up-and-coming filmmakers virtually overnight26, and also paved the way for Arnold Schwarzenegger to become the decade’s most ubiquitous27 action star. The film’s wildly successful box-office run afforded Cameron his pick of projects. After penning the first draft to 1985’s Rambo: First Blood Part II, the auteur settled on a follow-up to 1979’s Alien as his third cinematic endeavor28. Released in 1986, Alien — starring Sigourney Weaver, Bill Paxton and Lance Henriksen — instantly joined an extremely elite club of sequels that managed to equal their well-received predecessors29. The movie went on to earn seven Oscar nominations and a gross of over $100 million internationally, which allowed Cameron to indulge in his passion for all things aquatic on his next picture (1989’s The Abyss). After The Abyss opened to middling30 box-office returns and a far-from-enthusiastic critical response, James Cameron decided to return to the landscape of his most enthusiastically-received endeavor with a sequel to 1984’s The Terminator. 1991’s Terminator 2: Judgment Day ultimately managed to surpass31 all of the popular filmmaker’s prior works in terms of both critical popularity and financial success, as the movie’s groundbreaking32 sensibilities led to it breaking a series of records and eventually winning four Academy Awards (including Best Visual Effects and Best Sound). James Cameron subsequently33 used his unstoppable clout to mount his most ambitious and expensive endeavor up to that point, as 1994’s True Lies — which paired the director with Arnold Schwarzenegger for the third time — details the exploits34 of a first-class spy as he attempts to evade terrorists and also keep his wife (Jamie Lee Curtis) and daughter (Eliza Dushku) blissfully unaware of the true nature of his perilous day job. The film was a global success that would eventually come to be dwarfed by Cameron’s seventh big-screen effort, 1997’s Titanic. In 1996, James Cameron began shooting an epic romance set against the backdrop of the RMS Titanic’s legendary sinking. Armed with an all-star cast that includes Leonardo DiCaprio, Kate Winslet and Bill Paxton, James Cameron managed to survive what eventually became the most arduous35 and downright infamous shoots of his career after he delivered a film that shattered all preconceived notions of what makes a blockbuster. The movie, which managed to amass a worldwide box office tally of $1.8 billion and earn a whopping 11 Oscars, remains the most successful feature film in cinematic history, and the entire world waited with baited breath to see just how James Cameron would follow up such an endeavor. Rather than immediately return to the world of features, however, James Cameron decided to indulge his lifelong passion for the earth’s underwater realms. To that end, Cameron spent the next several years helming a series of documentaries detailing various aspects of the world beneath our feet — including 2002’s Expedition: Bismarck and 2003’s Ghosts of the Abyss. It was during that period that Cameron also dipped his toes into television’s notoriously fickle waters, as he created a science-fiction vehicle for Jessica Alba entitled Dark Angel (which ran for two seasons on Fox). Of course, James Cameron’s hordes of fans had been waiting years for the visionary filmmaker to step back into the world of fictional features. In 2005, Cameron announced that he was finally ready to step back into the ring with a typically ambitious science fiction endeavor entitled Avatar. Though little is known of the movie’s plot, Avatar is said to boast some of the most cutting-edge special effects yet seen on the silver screen and there’s little doubt that the film will expose audiences to visuals that are downright ground-breaking in their audacity36. (And, of course, it doesn’t hurt that James Cameron has managed to rope in a seriously impressive lot of actors – including Sam Worthington, Zoe Saldana and Sigourney Weaver.) James Cameron originally attempted to get this film made in 1999 as his immediate follow-up to Titanic (1997). However, at the time, the special effects he wanted for the movie ran the proposed budget up to $400 million. No studio would fund the film, and it was subsequently shelved for almost ten years.